Whether you are a football fan or not, the FIFA World Cup™ cannot pass you by. The sporting event which attracts over three billion viewers worldwide and around three million attendees is a spectacle which brings people together, young and old, as they passionately support their home nation. This year’s FIFA World Cup™ did not disappoint. From Brazil leaving the tournament in the Quarter finals, to four-time winner Italy, not even making it to the tournament, the event had the world captivated. And with the excessive growth of social media; the commentary, the jokes and statistics travelled instantly across the globe, adding to the football fever. The world now looks to Qatar for the 2022 tournament. The Emir of Qatar, HH Sheikh Tamim bin Hamad Al-Thani officially received the mantle for hosting the 2022 FIFA World Cup™ from Russian President Vladimir Putin in the presence of FIFA Chief Gianni Infantino at the Kremlin Palace on the final day of the 2018 event. As well as promising to deliver a fantastic 2022 FIFA World Cup™, The Emir of Qatar thanked the Russian President and people of Russia for giving Qataris the opportunity to exchange expertise. Qatar is already well underway with preparations to host the world’s most loved sporting event in just four years’ time. Evidence of this can be seen throughout the country as the infrastructure is enhanced to support the additional football stadiums. The training sites being constructed are on track to be completed by the end of 2019. Engineer Ahmed Al-Obaidly, Training Sites Manager at the Qatari Supreme Committee, said he was pleased with the progress to-date. But it is Qatar’s approach to sustainability that is unprecedented. Conceptualized by some of the world’s leading architects, the stadiums proposed for the 2022 FIFA World Cup Qatar™ are some of the most ambitious, visually exciting venues ever conceived. Qatar’s bid prioritized environmental efficiency of the stadiums, with the country looking to significantly reduce the environmental footprint of the event. To deliver the capacity required, Qatar intends to build and/or renovate seven stadiums, with the renovated Khalifa International Stadium already open. According to the Qatari Supreme Committee, the stadiums will be built with three leading-edge priorities in mind: Access and Comfort, Sustainability, and Post-tournament legacy. The Committee is working towards obtaining the Global Sustainability Assessment System Certification (GSAS) for all stadiums. In order to achieve this accreditation, the stadium designers and builders must use only the most environmentally friendly practices and materials. The aim is for all stadiums to be energy self-sufficient, using renewable or low-energy solutions where possible and even use this energy to power other facilities. The design and architectural challenges are immense. Not only do the stadiums need to house 40,000 seats for the group stages and at least 80,000 for the opening and final matches, they must evoke a sense of grandeur, excitement and achievement. In addition, in order to reach their sustainability goals, Qatar must balance this with the incorporation of renewable materials and cooling methods whilst adhering to best practices in environmental efficiency. 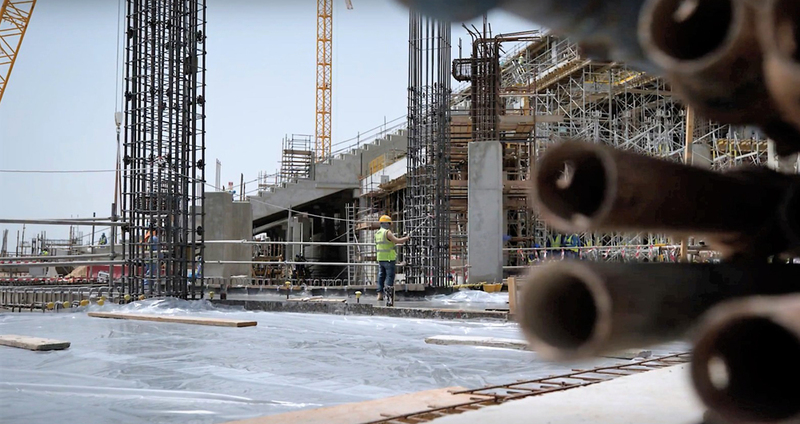 The bid for the 2022 FIFA World Cup™, by one of the Architects supporting the tournament, addressed the challenge of hosting the event in Qatar’s desert climate and to provide Qatar with stadiums that can be used at any time of the year. FIFA recommends the optimal temperature within the stadiums is 20-25 degrees. This micro-climate is a combination of the air temperature, wind speed, humidity and solar radiation all facilitating active and passive cooling systems. The company designed a model 500-seat stadium with cutting edge technologies, solar cells that powered the stadium's cooling systems and a solar tracker that moved a large canopy, providing insulation from the hot sun. This would help to reduce the temperature inside the stadium to 23°C compared to the 44°C heat Qatar might experience outside during the hotter summer months. However, now the tournament is taking place in November, the outside temperature is not as much of an issue, but the designs will continue to include such methods. The ground-breaking technologies used to create the micro-climate include perforated walls, channeling the hot air to a pool of water situated at the base of the stands. The cooled air then passes to the pitch, exiting the open roof. The solar massing on the roof blocks the heat from the sun and converts it into electricity for the stadium's other energy needs. Active cooling strategies use the abundantly available solar energy to absorb heat and power air-conditioning systems for the stadium. The most exciting aspect of this approach is that the technologies implemented will be carbon neutral. With world cup attendees of over three million, management of the sewerage, food, trash and consumables is also a huge task that has been addressed in every aspect of the planning. During the event, the stadiums will produce tonnes of solid waste and if untreated, end up in landfills causing environmental degradation. Tricon Food Consultants will be providing waste management strategies including assessing the quantity, segregation and recycling of waste material. Stadiums like Al Bayt will incorporate a modular design for waste-less deconstruction after the tournament. Furthermore, Qatar’s quest to reach new heights in sustainability for the next world cup is also evidenced in the country’s approach to transportation. According to FIFA's own research, transportation itself accounted for over 80% of the overall carbon footprint in the 2010 FIFA World Cup™. To reduce this impact, Qatar Rail is currently building a metro, rail and light rail systems. The rail network will offer 600,000 passenger trips per day by 2021. But what happens when the cheering stops, and Hamad International Airport waves goodbye to last of the joyful or despondent football fan? Qatar returns back to its normal, if somewhat less busy self with 7 state-of-the-art stadiums in place. A key aspect of Qatar’s approach has always been to address the legacy left by the tournament. Parts of the stadiums will be re-used in building new sporting facilities in Qatar, with some of the stadiums becoming parks for use by local communities. Qatar’s legacy will live on. There is probably no other sporting event in the world that enthuses people like the FIFA World Cup™. Qatar’s greener stadiums with surrounding sustainable infrastructure will await the world, hopefully providing a new global benchmark for future generations to benefit.